Patients who are engaged in their care enjoy improved clinical outcomes, report measurably higher levels of satisfaction, and are more loyal to their physicians. The Emmi Solutions Total Engagement program engages with patients across the continuum of care, in language they understand, allowing them to receive information when and where they want and on the devices they prefer. Not all engagement platforms deliver proven results. You are accountable for results. Your engagement partner should be too. 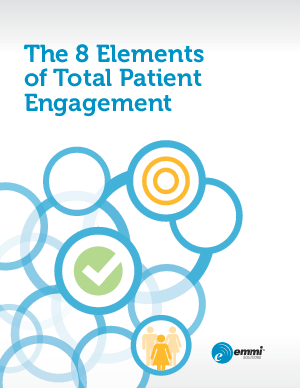 Download this paper to learn the 8 elements that create total patient engagement.